I firmly believe that it is important for you to be satisfied with your purchase. I will refund upon return of item, or substitute for another item in stock if you so choose. 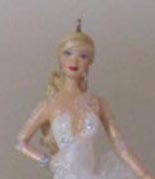 Hallmark Celebration Barbie Special 2008 Edition #9 in series This Celebration Barbie Ornament is a Special 2008 Edition, inspired by the Barbie Holiday Doll. 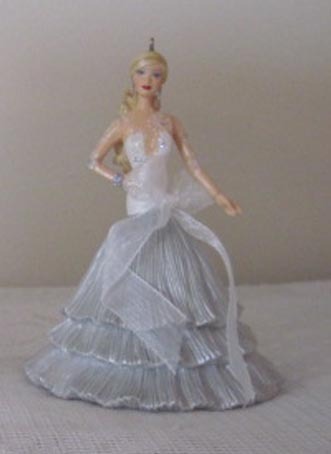 She measures approximately 4 inches tall. 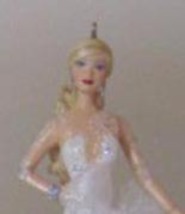 The blurb on the back of the box reads: All eyes will be on Barbie, waltzing unto the holiday gathering dressed in the most incredible gown ever! The bejeweled lace top sets off the lovely lines of a drop-waist skirt with 3 silvery pleated tiers, while a shimmering organza ribbon encircles the waist. A glittering bracelet and earrings add to this vision in silver. Barbie is made of acrylic, and was designed by Patricia Andrews, Hallmark Keepsake Artist. This is a non-smoking household. 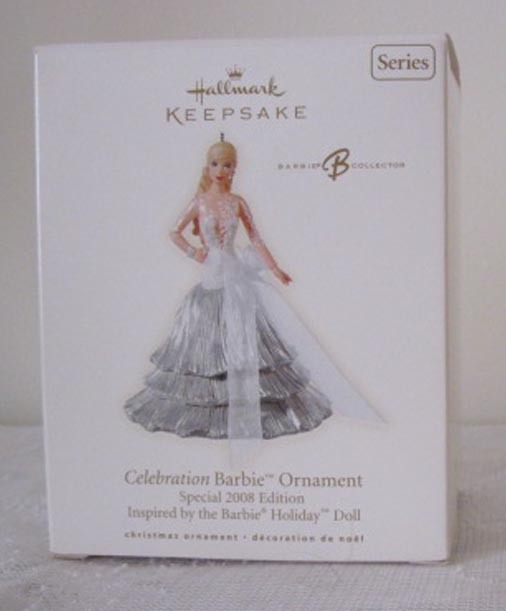 Product reviews for "Hallmark Christmas Ornament"